Tag line: "The Adventure Movie of the Year"
Director John Boorman’s The Emerald Forest is a touching family drama, a rousing adventure, and a gorgeously-photographed cautionary tale all rolled into one. Engineer Bill Markham (Powers Boothe), who is overseeing the construction of a dam near the Brazilian rainforest, has spent the last 10 years searching for his son Tommy, who was kidnapped by an indigenous tribe known as “The Invisible People”. He does eventually find Tommy (now a teenager, played by Charley Boorman), only to discover the boy has been accepted into the fold, and is now a full-fledged member of the tribe; the adopted son of the chief (Rui Polanah), Tommy is also married to the lovely Kachiri (Dira Paes). Try as he might, Markham is unable to convince his son to return home with him, and, upon making his way back to civilization, tells his wife (and Tommy’s mother) Jean (Meg Foster) that her son is alive, but she will likely never see him again. Fate intervenes, however, when a warrior tribe known as “The Fierce People” attacks Tommy’s village and carries off the women (including Kachiri), who are taken to a nearby brothel (in exchange for the ladies, the brothel’s owners give The Fierce People automatic weapons). Outmatched by their now heavily-armed foes, Tommy travels to the city to ask Markham for help, but will the son locate his estranged father in time to save Kachiri and the others? The event that sets the story in motion, the abduction of young Tommy (played as a youngster by William Rodriguez), happens rather abruptly, which makes his disappearance all the more poignant (the fact that a child can vanish as quickly as this is enough to give any parent nightmares). Boothe is quite strong in this scene, conveying the frustration and fear any man would feel in this situation (the moment he realizes his son is gone, a frantic Markham tears through the thick brush with his bare hands, calling out to Tommy, who, alas, is nowhere to be found). It’s definitely a powerful sequence, as is a later one in which father and son are finally reunited, a stirring scene that also features a bit of excitement (Markham and Tommy initially square off, only to team up when, after recognizing each other, they are attacked by The Fierce People, who had been chasing Markham through the jungle). After spending a few days with Tommy and his new “family”, Markham accepts that his son is now part of a different world, one that’s completely foreign to him, and it’s a bitter pill for the long-suffering father to swallow. Director Boorman balances dramatic moments such as this with scenes of adventure, juggling both aspects of his story perfectly to ensure each one is as effective as the other. In addition, The Emerald Forest is beautifully shot, with images that look as if they were lifted straight out of a travelogue (complementing the excellent work of cinematographer Philippe Rousselot is the superb musical score composed by Brian Gascoigne and Junior Homrich). Aside from giving his film a picturesque backdrop, Boorman also uses these images to call attention to the very real problem of deforestation (both The Invisible People and The Fierce People have, in recent years, been driven from the land of their ancestors, and as Markham tells Tommy, the dam his company is building will bring even more outsiders to the area, meaning the forest will continue to disappear). And if these scenes don’t drive the point home, a final message that flashes on-screen at the film’s conclusion (“The rain forests of the Amazon are disappearing at the rate of 5000 Acres per day. Four million Indians once lived there. 120 000 remain”) leaves little doubt as to what Boorman and screenwriter Rospo Pallenberg were trying to say. 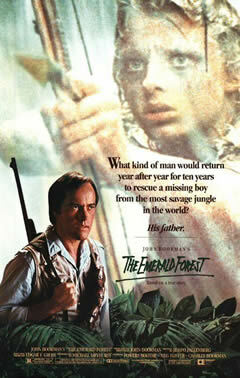 A moving, often thrilling film that also gives us something to think about, The Emerald Forest is an unforgettable motion picture experience.